How well I remember staying up late one Sunday night to watch Frank Capra's "Dirigible" (1931), the snowy landscapes rivaled only by the snowy image barely coming through as I twisted and turned the rabbit ears on my portable TV. I lived in Rhode Island, and I had to depend on the kindness of the weather to bring in that Connecticut station. If you had told me then that some day I'd be able to own a good copy on a little disc to watch any time I wanted with no commercials, I'd have asked you to stop teasing me with your lies. 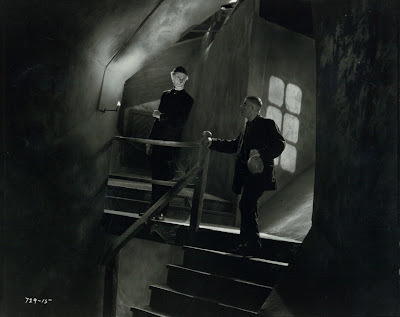 The only thing that lessened the TCM glow was when our cable company stopped broadcasting it in analogue. Now that it's digital, I can no longer record (and preserve) the movies of my choice on DVD. I have to rely on the DVR as a temporary way station rather than a permanent collection. On the other hand, it's a comfort to know that almost everything is available, often restored, at a reasonable price. And free on YouTube! I’ve still got two players, one still works. About 120 movies. My dad and I bought one in late 1981. Remember a VCR was a thousand dollars, and the cheapest tape of a classic film (not PD) was between 50 and one hundred dollars. The RCA system had a better picture quality than VHS (I can’t comment on Beta, never saw one), and I wanted to OWN classic films (long before AMC or TCM, you’d get to see classics one time a year. Even when I was a poor, struggling actor, I’d put my change in a coffee can at the end of each day. When I had the money to buy a RCA disc, I did. That was over 30 years ago. Sometimes I wish I bought stock in WalMart or McDonalds with all that money, but I got a lot of joy out of the CDE player, joy is better! I used it quite a bit until 2000 (when I got Turner Classic), and then infrequently, but I did use it. Like an old Studebaker in grandpa’s garage, I’ll turn it over once or twice a year, to make sure it still works. It sputters and stalls (both the car and CED player), but still works. I watch a copy of FAREWELL MY LOVELY, a film not on DVD in the USA, just to remember how great Robert Mitchum is. I’m now only a few years younger than he was when he played Phillip Marlowe, life goes by so fast. I found your blog in 2005. Yours is consistently the best. Many young people today know the Three Stooges, but haven't heard of the Marx Brothers, W.C. Fields, or Laurel and Hardy. And I'm finding that young Germans today aren't aware of the 30s-40s "Ufa" stars (Save immortal Heinz Ruhmann), whereas a decade ago many were. Entering my teens in the NYC Metro area during the early '70s, I well remember staying up after 11pm to catch WB-Busby Berkeley musicals on WNEW-5, the Astaire-Rogers pics on WOR-9 (still running that C&C Movietime package of RKO gems into a third decade), and the MGM Marx Brothers on WCBS-2. My mom introduced me and my younger sister to most of these joys. WNEW also ran L&H, while WPIX-11 had the Rascals; Hal Roach was a comedy god to my generation. I was collecting silent comedies on Super 8, never dreaming of owning the bounty of classic cinema that we have today. On the other hand, the more "shows" I go to - the Cinevents, Slapsticons, etc. - the more I'm reminded that these films work best with an audience. Hopefully the abundance of instant gratification won't consign that experience to oblivion. Boy, growing up around Chicago television in the 60’s and 70’s, classic films were everywhere. 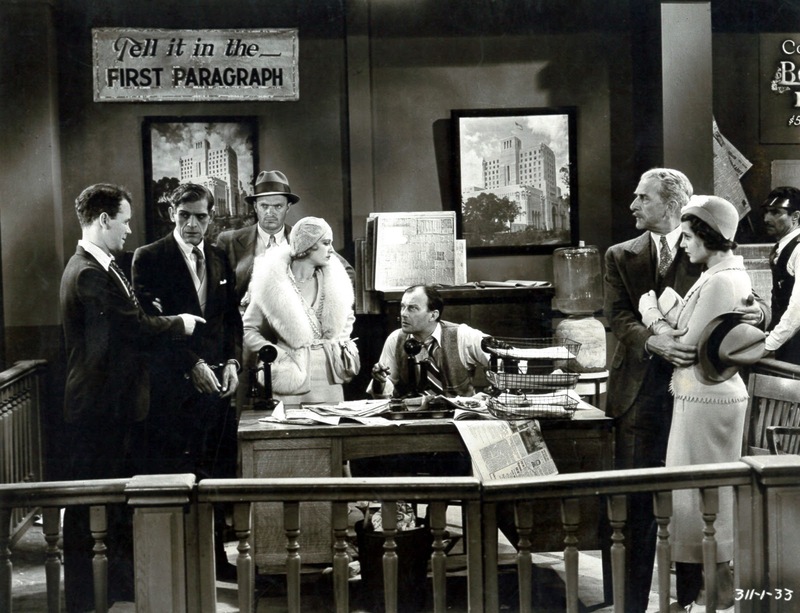 My fondest memories was first discovering the Marx Brothers and W. Fields on the Saturday late, late night movie on WLS-TV Channel 7 in 1969, Abbott and Costello on the WBBM-TV Channel 2 Afternoon Movie, many of them making their Chicago television premiers during the mid sixties, and of course the Three Stooges everyday after school on WGN-TV Channel 9, with Andy (Bob Bell) Starr! Hi John, what a wonderful (and encouraging) post! I remember as a kid "watching" movies I could barely even see, as they were pulled in via rabbit ears on the 21" B&W Zenith. I recall the horror of being halfway through a movie when my parents would haul me away for one reason or another, and thinking, "If only I could invent something by which I could come back later and resume watching at the same point I'd never ask God for another thing!" I invested first in Betamax (buying an enormous, top loading, second-hand one 1983) and thought I'd died and gone to heaven (even though the only film I had for months was the 1973 'Mame'), going next to laser disc, to VHS, to DVD, and now to streaming. I should have learned my 'archiving' lesson in 1996 as I stood above a landfill, nearly in tears, and dropped my collection of 400 plus Beta movies over the edge, when the last Beta machine I could find was judged to be beyond repair. I thought the DVD recorder with hard drive such a miracle that when they began to disappear I bought 2 more, both of which remain sealed in their cartons in the attic. I find now that aside from movies unlikely to ever see a DVD release (Ash Wednesday, 1973 anyone?) which I've transfered to DVD from other formats, I have lost my passion for "owning." I still have thousands of discs (commercial ones as well as those recorded from TCM), but even though I've cut the cable and said goodbye to Robert Osborn, I rarely haul out a disc anymore. I'm more than satisfied with Netflix, YouTube, and Warner Archive Instant, which Greenbriar turned me on to! I had a Spectravision, which I got just before VCRs began to plunge in price. When I got a VCR, I discovered I could tape stuff off the RCA discs onto tapes, like taping LPs onto cassettes. No editing or anything fancy, but I could put a cartoon before a feature. As VHS began to wildly outstrip RCA in terms of content, I ended up hauling it all to Salvation Army when I moved. -- The summer a local station ran all the Universal Sherlocks on weekends, with a live host. -- A later summer series of feature versions of Republic cliffhangers. -- Discovering UHF, home not only of vintage Paramounts but strange animated imports. -- Various silent showcases on local & national public television. -- The ongoing appearance of mind-boggling, once-forbidden treasures. Wartime Disney! Charlie Chan! Harold Lloyd! Short subjects! The GOOD Popeyes! In terms of availability and quality, it does indeed keep getting better. But if I had to base a golden age on anything else, I'd say around the 70s when there were more venues where the faithful could gather and experience old movies as movies. Yes, it was Casablanca and Duck Soup every other week; and other favorites had to be relived through the photos in "The Films of" books, or soundtrack LPs with snatches of dialogue. But scarcity was balanced by the sense of community and a certain anticipation. Fantasies of owning a Bell & Howell projector and being rich enough to rent from the 16mm catalogs. And then my first VHS machine in 1979. Such a thrill to be able to tape off Tv a favorite film. One great regret is not being able to see classic movies on the big screen. Other than the National Film Theatre in London, here in the UK you couldn't see vintage Hollywood in cinemas. Being 11 years old in 1984, I suppose I would've been in this new "golden age" of video. It's a good thing home video came along when it did then, because I am also among the last generation, as I've stated on these pages before, to enjoy daily doses of Little Rascals/Laurel & Hardy and all-night classic movies on TV. Within a few years the changes started coming - FOX (and later, UPN and CW) came along and took away evening movies from our best local UHF channels, and infomercials began to replace all-night movies. I remember our first VCR, a $600+ VHS top-loader with a corded "remote" that controlled play and pause only. I also remember going to the local Tower Records to rent tapes for the first time. The first rental tape I ever watched was a PD Chaplin Keystone collection from Video Yesteryear. I was shocked by my father when he told me we had to return the tapes the next day - I thought it was like the library where you got to check them out and keep them for a couple weeks! My father wasn't a big technology person so we never paid attention to VHS vs. Beta vs. CED vs. Laserdisc. We never owned a lot of movies either, as we mainly used the VCR to record stuff off TV (I have precious few magnetic time capsules left from that period and they are slowly deteriorating). Only in the last few years did I actually purchase a Beta machine for myself, because I finally realized that with every new format or tech that comes along, less and less becomes available. Some really obscure stuff initially released on Beta never saw release on VHS, which means it was probably never on DVD and will never be on streaming (a technology I have yet to embrace). The flip side of this is YouTube, where, as Kevin noted, all kinds of stuff is available for free, much of which actually has no reason to be released in a hard format (old TV commercials and station IDs, for example). Archive.org is also a wonderful and surprisingly extensive source of material. And with browser addons and extensions, capturing and saving videos is easier than ever - especially on YouTube when something could disappear at any time due to copyright or account issues. I wish you were right--but I'm sure you are wrong: young people (under 40) are incredibly ignorant about film history. And lazy. Check dvd sales. Only a few classic sell (Wiz of Oz). Even free youtube views for classic films and scenes are minimal--often less than ten thousand worldwide (!) even for Fred Astaire. All excellent points, John. This is certainly a Golden Age for those of us who spent decades gallivanting all over (in my case) California every time there was a chance to see San Francisco or Meet Me in St. Louis or The Gang's All Here, eagerly grateful for whatever we got. But what's the value of gold when it's easily manufactured? I'm afraid many today don't know enough not to take this cornucopia for granted. Witness the appalling number of youngsters who flatly refuse to watch a black-and-white movie; for them, film history began the night Daddy drove them and little-Suzie-next-door down to the multiplex to see Titanic. Charles D. Miles's memory plays him slightly false regarding that early RCA foray into home video. Its commercial name was SelectaVision, and the technology was the CED (capacitance electronic disc) system. Otherwise his recollection is right on the money, and I share his nostalgic fondness for it. Like him, I bought my player because I couldn't afford VHS, which in those days could cost as much as a washer, dryer and refrigerator combined; 150 1980s dollars was about my limit. The picture was indeed superior to VHS. Only real drawback was that the discs had a tendency to skip, this being an actual needle-in-groove technology (each SelectaVision "caddy" contained a 12-inch vinyl disc with a wide center hole like a 45rpm record). I found that the skipping could often be alleviated by manipulating the reverse button to run through the offending spot over and over, like ironing a crease in a pair of pants. When RCA bailed on SelectaVision in 1984, stores in my area started dumping the discs, both new and rentals, for a buck a pop, and I stockpiled quite a library, four or five hundred of them. Like Mr. Miles, I still have two players, and as far as I know they remain in perfect running order. There's no room for them (or the discs) in the house anymore, and I couldn't give them away, so they've been banished to the garage. 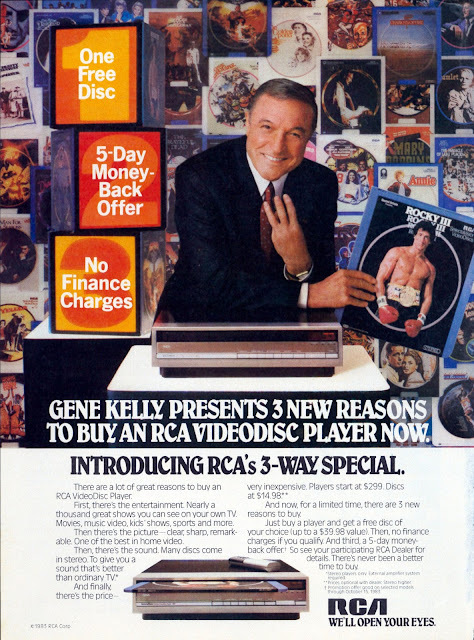 But I still get a little nostalgic frisson at the memory of that shimmering little fanfare that accompanied "An RCA SelectaVision Videodisc Presentation" at the beginning of each disc, and I kind of miss it. Mr. McElwee, I enjoyed reading your recent Greenbriar posts on extinct classics and home entertainment formats. I am a part of the millennial generation, and I highly appreciate classic film. My true encounter with classic film began while attending middle school, reading Dorling-Kindersley's "Chronicle of the Cinema" (back in 2001). I still have that book, and it is still a handy reference. During my sophomore year in High School, my family and I went to the Weinberg Center for the Performing Arts in Frederick, Maryland (formerly the Tivoli, which was owned by Warner Bros. from the late 1920s until the 1948 decree). We watched a film print of the 1942 classic, "Holiday Inn". Everyone enjoyed it. While attending Frederick Community College (2007-2011), I took "Introduction to Film". That class turned out to be a complete joke. The instructor knew little to nothing about film. He never covered the early days of cinema, the transition from silent to sound (he never even heard of "Vitaphone"), how television affected cinema, foreign film, documentaries, etc. At the end of that course, I was flattered that many of my friends and fellow students stated that they learned more from my expertise than the instructor! The only classic film shown was Alfred Hitchcock's "Psycho". In my last year of college, I took a course called "Film as Literature". Just like the previous course, it was disappointing (and had little to do with the subject). The films shown in that class were less than stellar (classics were never shown), and had nothing to do with literature. Overall, the sad part was that both instructors had never seen "Gone with the Wind" or "Casablanca". 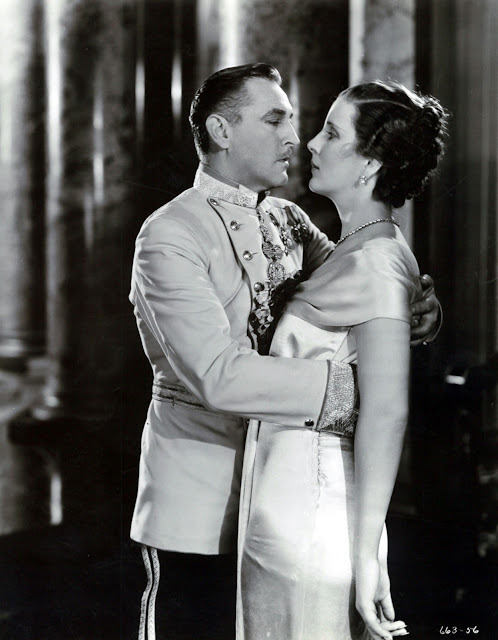 Classic film (along with independently-produced features) falls on deaf ears in Frederick. The area missed out on the TCM revival screening of Casablanca in 2012, when Regal Cinemas decided that it was more important to show the re-release of James Cameron's Titanic (1997) in 3-D. Around the same time, the former Tivoli (Weinberg) decided to ignore their classic heritage by screening films from the 1980s. Not that there's anything wrong with some features from the 1980s, but they wouldn't have been shown at the Weinberg during their general release period. Those features would have been shown at several area multiplexes (the three that we had quickly disappeared after Regal built their 16-screen eyesore in late 2002). I still watch classic films on DVD/Blu-Ray, TCM, Public TV, and the local commercial stations' sub-channels. Antenna TV programs several Columbia oldies depending on that day’s lineup. 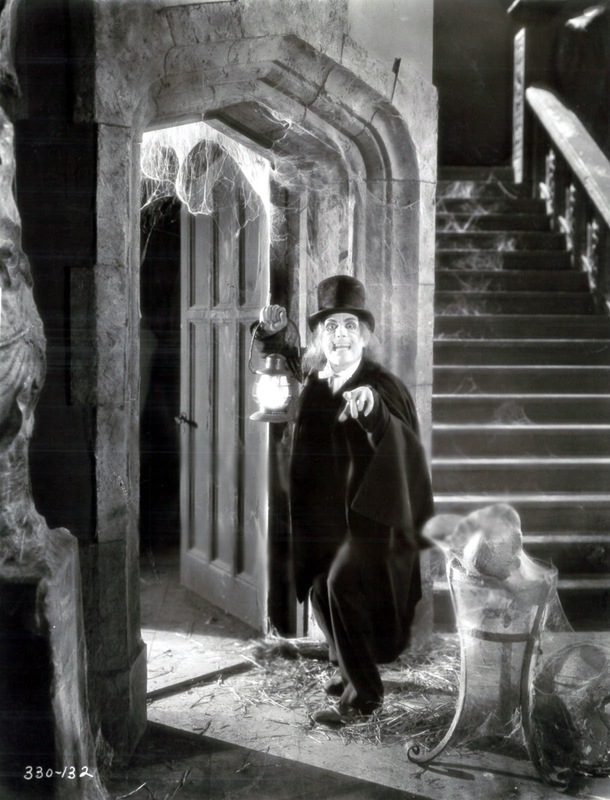 Me-TV airs classic Universal horror features on Saturday night- presented by iconic Chicago horror host “Svengoolie” (despite having commercial breaks). Even though in this day and age of streaming, I would rather own my own copy of a classic on DVD or Blu-Ray (even if it was a title through Warner Archive or any of the other studios' MOD services- whenever the price fits my budget). As a student of film and television production, I think that all generations should appreciate classic cinema sometime in life. It seems like that today’s movies look the same (mostly action, horror, and superhero-related features). Some of my old friends have appreciated the classics (whether broadcast on TCM, viewed on DVD/Blu-Ray, or through some streaming service).